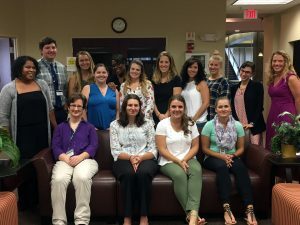 Some of the SUNY Oswego teacher candidates who served in a full-time, clinically rich residency program with the Syracuse City School District gather for a photo prior to starting their fall 2017 placements in Van Duyn or Franklin elementary schools. OSWEGO — The SUNY Oswego School of Education has joined three other educator-preparation schools in Bank Street College’s Prepared to Teach-New York Learning Network, an initiative designed to develop sustainable funding pathways for residency programs that embed teacher candidates in schools and communities for two full semesters. Prepared to Teach-NY, recipient of a $500,000 grant from Carnegie Corporation of New York, cites evidence to support a sea change in what represents “student teaching” in the state. The new model takes a page from residencies in medical professions for deeper, richer, authentic experiences linking school placements to concurrent education coursework. Rather than two, typically, seven-week student teaching experiences, proponents say, paid full-time 30-week residencies over two semesters attract more candidates from underrepresented groups and make for new teachers that are better prepared and more likely to stay in their careers. In turn, a district’s schoolchildren and mentor-teachers benefit from new ideas and classroom support that teaching residents and college faculty bring to the schools. “It’s truly an honor to be a part of the inaugural cohort of Prepared to Teach and its New York Learning Network,” said Pamela Michel, dean of Oswego’s School of Education. Starting in 2012, SUNY Oswego piloted clinically rich teacher residencies in urban schools, thanks to funding through the Obama administration’s Race to the Top program. Now, with the assistance of a five-year, $1.3 million grant under the New York State Education Department’s My Brother’s Keeper initiative, Oswego has taken the concept further, moving to double to 50 the number of candidates — including 20 teacher residents each year — in its Teacher Opportunity Corps II program. Teacher residency programs now need to find funding sources to sustain this new model of teacher preparation, and Manhattan’s Bank Street College has stepped up. The Prepared to Teach-New York Learning Network project invited SUNY Oswego, Adelphi University, College of Staten Island and Marist College to participate, “helping create a movement that demonstrates the vision and possibility — from the ground up — of what it can look like in New York state when all new teachers are well prepared from day one,” wrote Karen DeMoss, director of Prepared to Teach, in SUNY Oswego’s invitation for the project. When large federal and state funding sources that have supported residency programs sunset, the task becomes working with school districts that understand teacher residency programs are worth more than their weight in terms of support for teacher recruitment and increased teacher-retention, lower costs in new-teacher training, more support for student learning with a second teacher in the classroom and additional professional development opportunities for mentor teachers. SUNY Oswego has had about 100 teacher candidates work in residency programs — most in the Syracuse City School District — in the past six years. At least 30 graduates are teaching full time in the Syracuse district, Russo said. 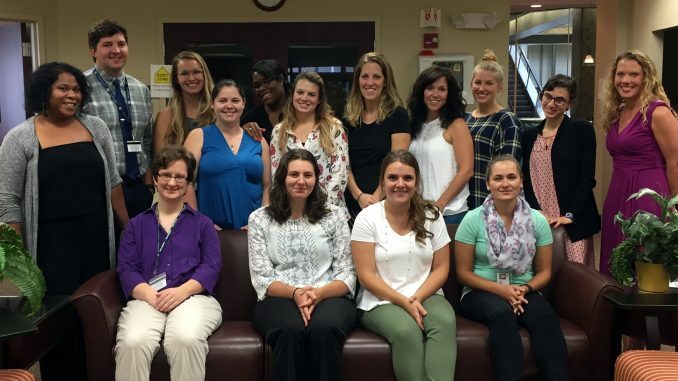 This year, a new cohort of 34 teacher residents are in full-time residency placements in Van Duyn and Franklin elementary schools and six secondary schools in the Syracuse district. Eighteen months ago, the American Association of Colleges of Teacher Education produced a series of videos featuring SUNY Oswego and SCSD teacher residents in TESOL (Teaching English to Speakers of Other Languages) and their college faculty, mentor-teachers, administrators and high school students. All presented anecdotal evidence in support of the residency program. “When it comes to hiring, there’s nothing more valuable than having that long-term exposure to candidate teachers,” said Scott Persampieri, director of the school district’s teacher recruitment and selection initiative. SCSD Superintendent Jaime Alicea also appeared in the videos, and praised SUNY Oswego for providing much-needed teaching talent in such disciplines as technology and teaching English as a new language. “You want to find that college that really wants to work with you, that is willing to accommodate the needs the district has,” he said. Russo said that in the coming years, SUNY Oswego hopes to expand teacher residency programs to Oswego County schools and to Onondaga County schools beyond the Syracuse school district. For more information, visit oswego.edu/education, email [email protected] or call 315-312-2632.